All too often predator anglers will mount their deadbaits upon their pike rig, cast it out and sit for hours on end waiting for that drop-off to fall, the alarm to scream or the float to go under. Meanwhile, there could well be a double or even a twenty-pounder making its way around the marginal shelf, seeking the odd roach or two to eat, and that’s an opportunity not to be missed. All you need is your pike rig, a full-bodied deadbait, a large split shot and that’s it! Tie your pike rig to your mainline and pinch the split shot (an SSG or a few AA is ideal) onto the swivel end of the wire trace. Mounting the deadbait needs to be done head first. Push one hook of the mid-trebles through the bottom lip of the deadbait and out of the top lip. Now work the bottom-most treble into the flank of the deadbait. And that’s all you need to do. The split shot upon the line will help sink the deadbait when you stop reeling in, and a gentle flick of the rod tip will see the bait shoot upwards or sideways. Continue doing this – reeling, resting and flicking – and you’ll make your deadbait look just like an injured food fish. And that’s pretty hard for any nearby pike to ignore. 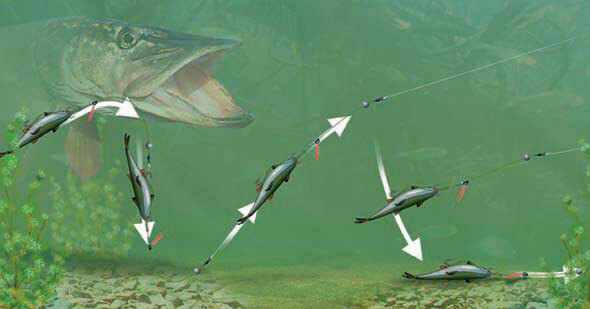 The best baits for wobbling are freshly killed trout because they wriggle and bend as they are flicked. Other great wobbling baits are long eel sections, herrings, roach and smelt. Mackerel are often just too large for wobbling.